Is Walmart Hiding $76 Billion in Overseas Tax Havens? The Big Box retailer is offshoring more than jobs. Walmart executives appear to have way more money than they know what to do with, but know exactly where to hide it. Its big box is roomy enough to hide billions in un- and undertaxed profits, according to a new report by a watchdog group. While the retail giant is known for capitalizing on corporate tax breaks and driving the offshoring of jobs to the Global South, little is known about how much of its assets are hidden from Uncle Sam and offshored to far-flung tax havens. According to the financial investigation, Walmart is stashing “at least $76 billion worth of assets in 78 subsidiaries and branches located in 15 overseas tax havens.” Though that figure is disputed by Walmart, Americans for Tax Fairness (ATF) maintains that these subsidiaries operate as a vast network of shell companies. The report, by researchers with ATF and United Food and Commercial Workers, argues that this arrangement of financial black sites lets Walmart circumvent US tax codes and enjoy minimal taxation abroad. The countries in which Walmart’s international operating companies are owned by tax-haven based subsidiaries include: Africa (360 stores in South Africa, plus 36 stores in Botswana, Ghana, Lesotho, Malawi, Mozambique, Namibia, Nigeria, Swaziland, Tanzania, Uganda and Zambia), Brazil (557 stores), Central America (690 stores in Costa Rica, El Salvador, Guatemala, Honduras and Nicaragua), Chile (404 stores), China (411 stores), Japan (430 stores), and the United Kingdom (592 stores)…. The report suggests that Walmart is avoiding taxes by channeling foreign earnings though “hybrid financial instruments and complex inter-company debt arrangements,” including an arcane mechanism of a hybrid loan, and “borrowing” billions in short-term loans from Walmart’s own subsidiaries. Walmart spokesperson Randy Hargove argued in its public response that it complies with tax laws of the United States and countries where it operates. The company contends that ATF’s accounting is based on misleading calculations of Walmart’s investments in subsidiaries and intercompany loans, and that the official figure on foreign assets is $80.5 billion, mostly in “retail store buildings, fixtures, inventory and distribution facilities physically located” overseas. Policymakers in the United States and abroad should press Walmart for accurate and complete country-by-country information on its income and taxes paid, assets, number of employees and more, including for their subsidiaries. The report also recommends that the Security and Exchange Commission demand a full public disclosure of “all of the business entities in its undisclosed network of subsidiaries in tax havens,” their ownership and relationship to Walmart’s US-based businesses. More broadly, ATF joins a global coalition of reform groups in calling for a comprehensive international financial-regulatory framework under the OECD to ensure companies like Walmart are restricted from hoarding profits through unfair arbitrage-like scheming between jurisdictions. But if we, as taxpaying citizens, step back and look at the untapped potential of all that hoarded wealth, it’s not hard to imagine ways that offshored money could be put back to use. Aside from paying its fair share of corporate taxes, Walmart could redeploy those assets toward simply paying workers a fair wage: Last year Demos published an analysis showing that by shifting some of its internal stock-purchasing expenditures, the company could give a more than $5-an-hour raise to 825,000 workers who earn less than $25,000 annually. Walmart could also use such reforms to meet the Fight for 15 movement’s demand for a $15 minimum wage across its workforce. 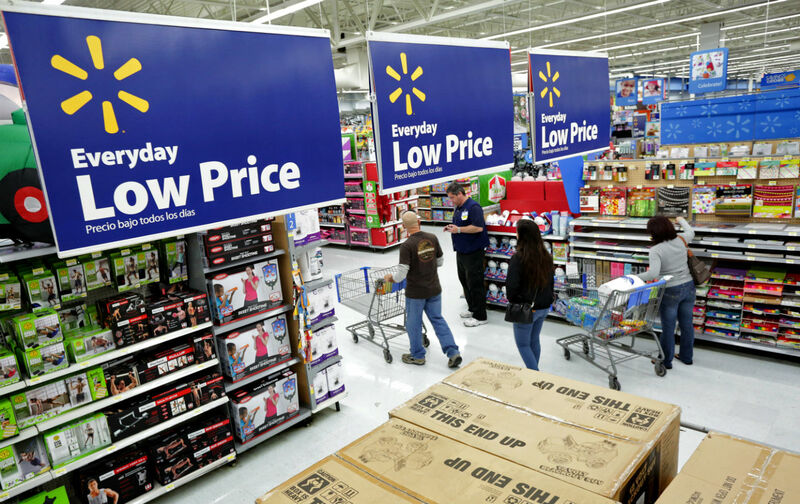 Walmart could furthermore boost wages across its vast supply chain. Food Chain Workers Alliance has pressed Walmart to ensure that everyone working for a US supplier, from tomato pickers to warehouse workers, earns $15 per hour with benefits. As the largest private company in the world, Walmart is easily a trendsetter.… the architecture of the modern global supply chain was designed and accelerated by Walmart. And thus we believe their practices and behavior will have a standard-setting effect. Of course, Walmart is already setting standards, they’re just double standards. And now it seems its executives not only set wages for the world’s workers; it sets tax codes around the world, too.